JayJay Here. Back in the Marvel days Jim frequently would give a gift box of Godiva chocolates to people for their birthdays, anniversaries, etc. It was a popular gift with the staff and even more popular when the recipient shared! One year Archie Goodwin made the birthday card below for Jim. 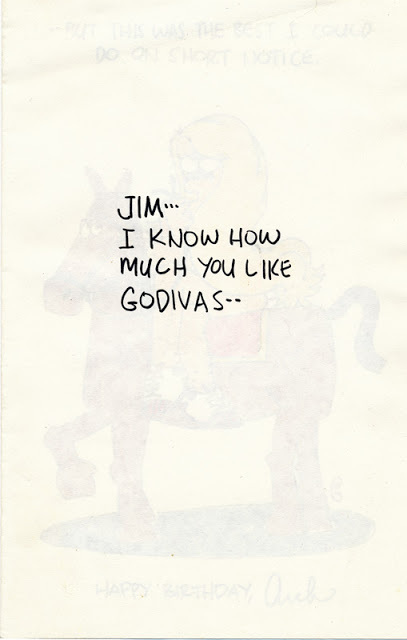 Y'know, I'd heard of Lady Godiva but never knew the story, so I didn't get this joke. After looking her up on Wikipedia, I get it now and also learned the origin of the phrase "Peeping Tom!" 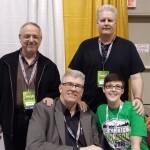 …Considering the chronic pain I have in the diaphramial region these days from CVS, either Jim needs to add a [LAUGHS AHEAD] warning to posts like this, or I need to double the level of pain killers I take before reading his blog. I've long wanted to see more Archie Goodwin art, but I never expected a piece like this! 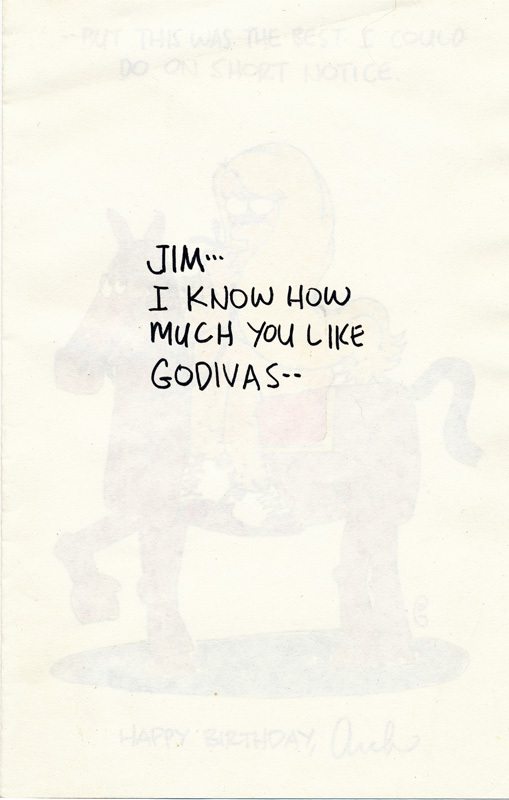 Godiva chocolates are transient, but a Godiva cartoon is forever! One of the best custom cards I've ever seen. Wonderful! How sad he passed away so early.